KoolR Magnum will service both small and mid sized residential wine cellars. Maximum wall thickness: 6 1/2"
Koolspace™ cooling units are designed to sit in a hole in the wall, roughly equal size to the cooling unit itself. KoolR Plus vent directly to and an adjacent air-conditioned interior space. The KoolR units can not mount in the ceiling or on the floor. They are not designed to work with ductwork nor be installed directly to the outside. These are interior, through the wall units only. 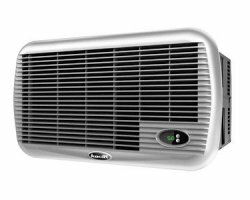 Ideally, koolR/KoolRPlus Magnum units should be installed above a door as they need air circulation around and below the unit. The wine cellar cooling units conveniently monitor the temperature inside your wine cellar, with digital display showing in adjacent room. koolR & KoolRPlus (Magnum) wine cellar cooling units come with a silvercolored grill which is visible from the adjacent room. This is to allow the exterior grill to blend in better with the wall decor in the adjacent room. The grill can be painted if you desire. Please note the digital display for the koolR is NOT inside the wine cellar. The koolR wine cellar cooling units come with a silver colored grill which is visible from the adjacent room. This is to allow the exterior grill to blend in better with the wall decor in the adjacent room. The grill can be painted if you desire. koolR™ is the standard for which others measure the noise of their wine cooling units. Leading the industry in efficiency, power and quality, Koolspace™ electronic wine cellar cooling units are the right choice for any climate controlled wine cellar. Koolspace™ . Koolspace™ wine cellar cooling units incorporate the world's smallest controller in it's class. The koolR should ideally be installed above a door as it does need air circulation around and below the unit. The koolR™ cooling units digital temperature display is on warm side of cooling unit so you see cellar temperature without going into the wine cellar. Super smart controls sense cellar conditions and adjust power levels automatically. These units will run as quietly as your conditions allow, giving you precise temperature and higher humidity levels around the clock. super energy efficient, hi-temperature alarm, humidity warning, and vibration suppression system. koolR™ cooling units need to vent through a wall to an adjacent interior room or large hallway in your home. They are not designed to go through the ceiling, floor or ductwork or directly to the outside. Please read the owner's manual. These units must be installed high in the room. Quick mounting, reduced vibration and thickest epoxied copper in the industry. koolR™ cooling units need to vent through a wall to an adjacent climate controlled interior room. They are not designed to go through the ceiling, floor or ductwork or directly to the outside. The are also not designed to be installed in a small cabinet as these units need clearance to the front, sides and bottom for air circulation. Quietest wall mounted cooling units on the market because of the fan technology. What is the true power rating? Compressors are sized according to the BTU rating, however the TRUE cooling power of a unit has to do with the size of the coils and the fans. koolR™ has been tested in against a series of leading competitors with same size compressor. With koolR's™ larger coils and greater airflow - there really was no contest! What about the key components? Koolspace spends a lot more on components like Embraco compressors, hi-flow axial fans and stainless steel. Others save a bundle with offshore parts, then they charge more for their products! koolR™ is engineered for quiet, with an exclusive Acoustic Isolation Chamber, koolR™ produces far less noise, with much greater airflow than others. Absolutely! Electronic controls maximize efficiency as well as guarantee longer life and our controls are the world's smallest and most advanced. Digital controls with LED are standard, not an upgrade! The digital display is on the warm side of the cellar. Meaning you cannot read the digital display when you are inside the cellar, you need to stand in the adjacent room and look at the back of the unit. This is actually very desirable as you'll be able to see temperature within the cellar without needing to open the door to check. All koolR units plug into standard North American household outlet. Dedicated preferred. Electrical outlet should be inside the cellar. Shocking, but most wine cooling units are not certified. Every koolR™ is CSA,UL C and CE-Certified to the most rigorous international standards. Only the koolR™ line of wine cellar cooling unit, with their multi-point isolation, can claim to eliminate the vibration created by all of the major components as well as the exterior housing. What happens to the condensate? Some systems use manual electric condensate evaporators, which waste energy and efficiency, to boil away their excessive condensation. KoolR™ uses the condensate to cool the system and increase efficiency. This saves energy and maintains higher humidity. Aging wines generate acetic acid, which can shorten the life of your coils. koolR's™ hermetically-sealed controller, E-coated coils and cabinet give corrosion protection like no other. Compare, compare, compare. Feature for feature, dollar for dollar, compare koolR™ with any other wine cooling unit available. KoolR™ has a refined design, more features and better value than any other. If you would like racking as well, we will be happy to customize a design and obtain a shipping quote for your entire order to go to the Wine Racks Page. Our Koolspace wine cellar cooling units are a stock item and are readily available for shipment to destinations within the United States of America (USA) and Canada. KoolR & KoolR Plus wine cooling units are distributed throughout Toronto, Mississauga, ON, Ontario, L5T 1K4 & L5S 122, Canada, as well as Phoenix, Arizona, 85001, United States of America. MARCH 2016 - ALERT - The Manufacturer has just discontinued the smaller Piccolo KoolR - we are still in the process of updating our website with current information, but have taken the KoolR Piccolo offline. Ships from Arizona directly to you. CANADIAN CUSTOMERS - Free shipping promo is for major Canadian City. You will be contacted prior to order being processed if additional shipping charges apply. Please note, should you need to return cooling unit in compliance with our returns policy original shipping will be assessed at $75 for major Canadian cities and customer is responsible for return delivery charges.